An artful Boho cuff of black leather featuring a hand-painted row of antiqued gold peace signs with rose vines wrapped around each one and tiny Swarovski crystal rhinestones sprinkled around the design! It's a completely unique piece of wearable art with bold, yet beautiful Boho personality that will add its chic charm to your outfit! The painted design is executed using quality paints that are very durable and lasting so you will wear your bracelet for a long time! And it's adjustable so it is sure to fit your wrist comfortably! BOHEMIAN FLORAL STYLE! 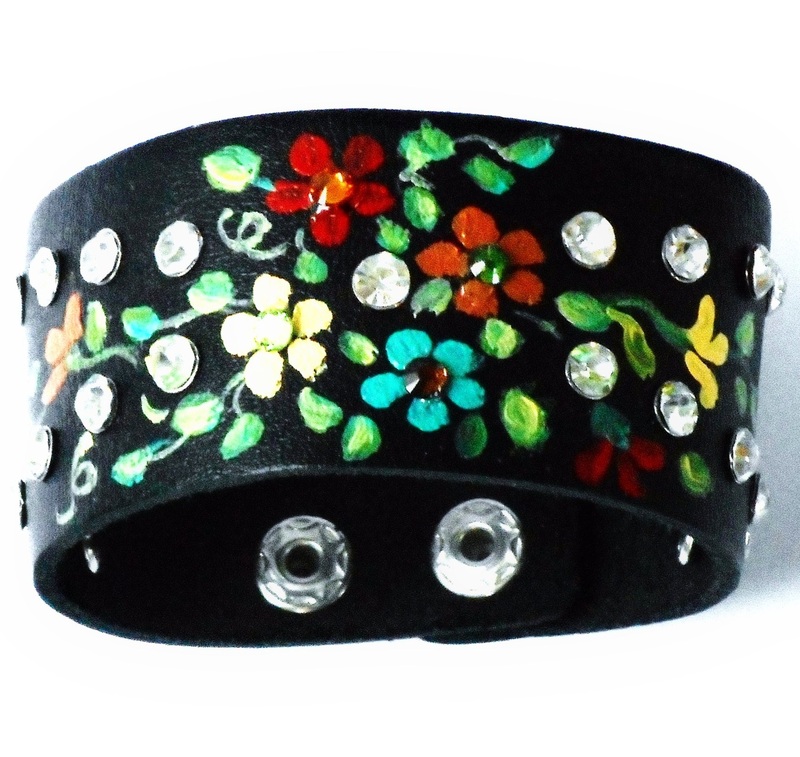 A bold and beautiful leather cuff with colorful Boho personality featuring hand-painted flowers in turquoise, red, purple, & yellow, with sparkling Swarovski crystal rhinestones in their centers! 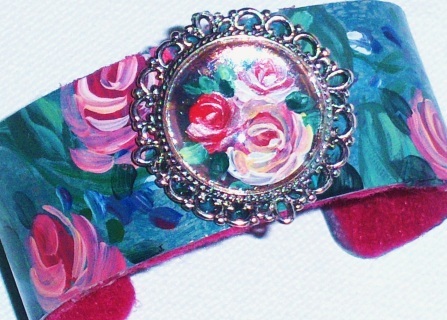 It's such a unique bracelet that you can wrap around your wrist to add its artsy floral style to your outfit! And it's adjustable with two snap closure size options, so you can be assured that it's going to fit you comfortably! FUNKY FLORAL BOHO CHIC STYLE! A chic brown leather cuff covered in colorful hand-painted flowers with the tiniest bit of glam! Little multi-colored Swarovski crystal rhinestones sparkle from the centers of a few special flowers for tiny sparks of color and antiqued gold studs add a touch of chic! 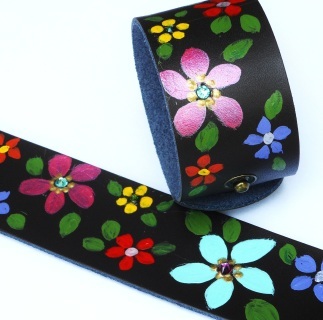 The high-quality paint is well-protected with several coatings of durable finish to keep the design looking great and the cuff has two adjustable settings! 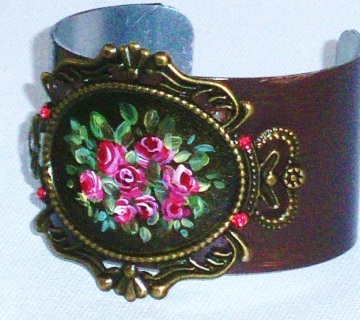 A romantic cuff bracelet with vintage floral charm! 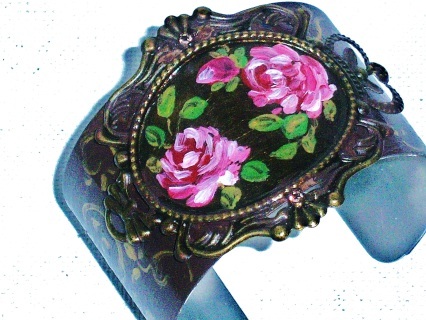 I started this piece by painting the metal cuff a rich brown, topping it with the antiqued medallion, decorated with tiny pink roses and sparkling pink Swarovski crystal rhinestones! 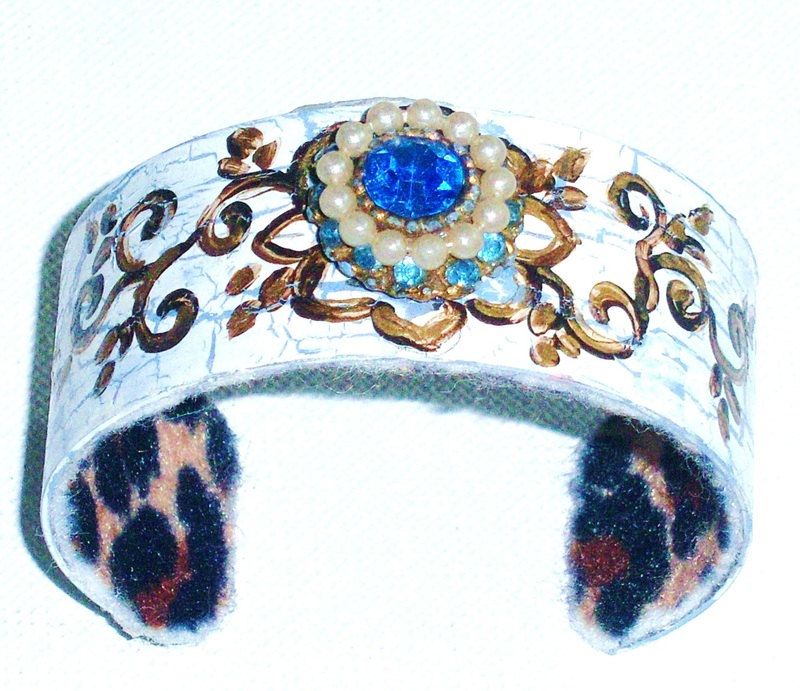 A great cuff to add some feminine style to an outfit! 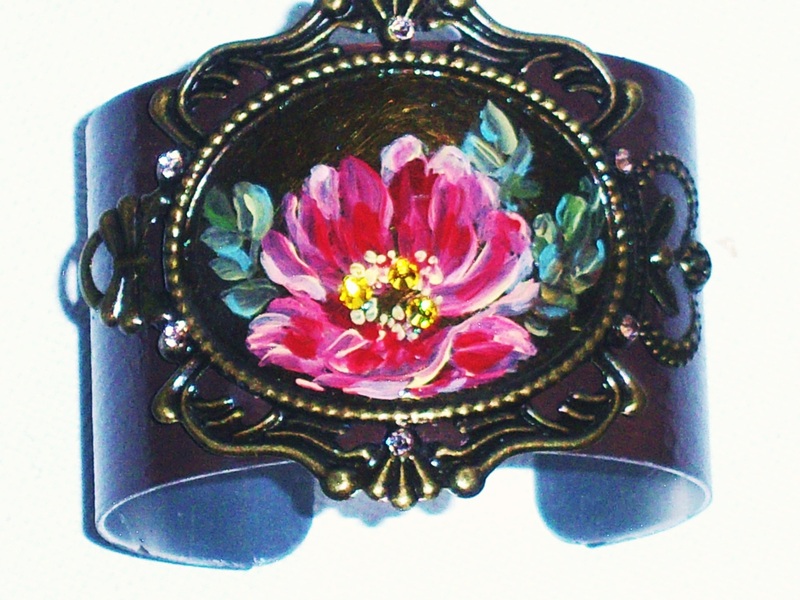 An original floral cuff bracelet with vintage Boho charm that will add romantic style to any outfit! The painted rose design is framed by an antiqued medallion, which is enhanced by a couple of tiny pale pink Swarovski crystal rhinestones! The flexible metal cuff is a rich brown with graceful gold swirls designs...such a unique piece! PRETTY PINK ROSES A unique cuff to add some Bohemian Floral style to an outfit! I decorated the cuff with a washed finish of greens and gold and added some painted rosebuds. 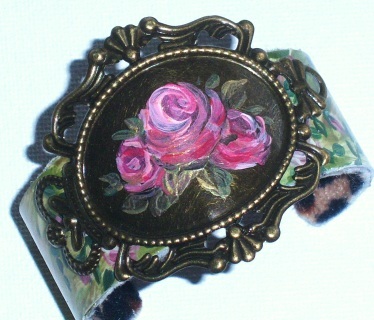 I added an antiqued gold medallion framing a cluster of roses to enhance its vintage quality! I then lined the back of the cuff with soft felt lining so this flexible cuff is really comfortable! A feminine floral cuff,painted rich brown and featuring a vibrant hand-painted rose on an antiqued medallion in its center! I even added a few sparkling pale pink Swarovski crystal rhinestone accents to the frame! Pretty and unique! 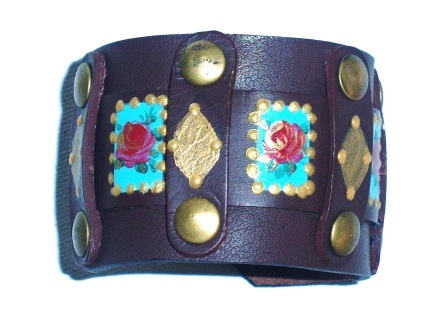 ROMANTIC BOHO Wrap this artful one-of-a-kind leather cuff around your wrist to add some funky Boho charm to your outfit! I hand-painted the original design onto the rich brown cuff using shades of turquoise, gold, and pink to coordinate with the decorative antiqued studs and add touches of color! This cuff is adjustable for a comfortable fit! 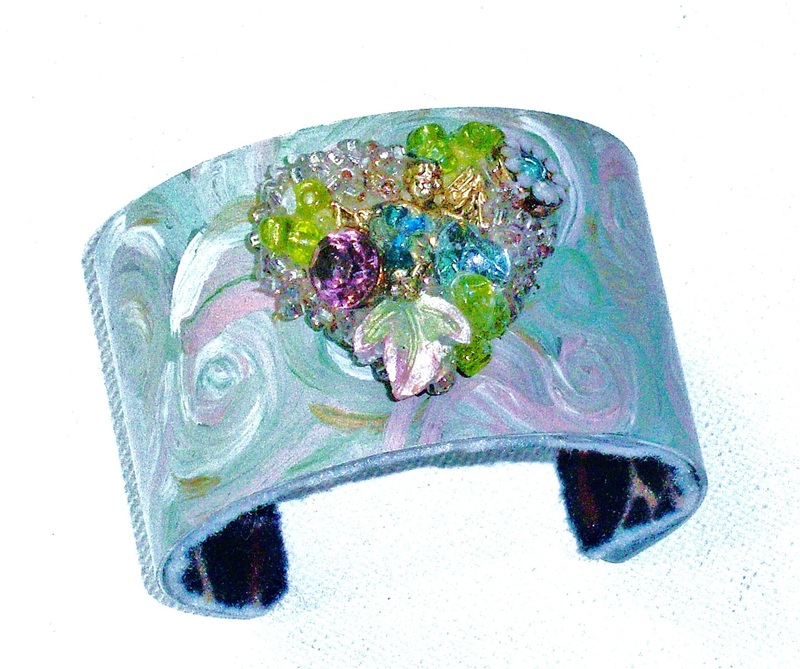 This cuff has originality, with its painted swirls in pale pink, green and cream, and its heart decoration, an assemblage including tiny seed beads, sparkling rhinestones, and assorted findings! A creative piece that will add personality to any outfit! 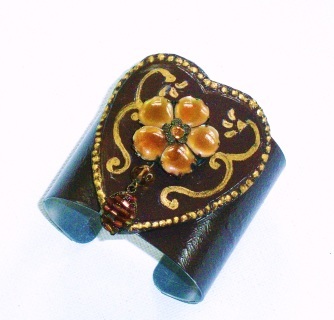 Metal cuff 1 1/2" wide, 6 1/2" long, Heart Medallion 1 1/4" high, 1 1/4" wide, felt lined for comfort! A unique cuff featuring a crackled finish of cream with pretty dove blue peeking through and antiqued gold flourishes! In the center, I placed a vibrant blue rhinestone medallion, with tiny faux pearls and rhinestone accents! I even lined the cuff with soft felt lining! 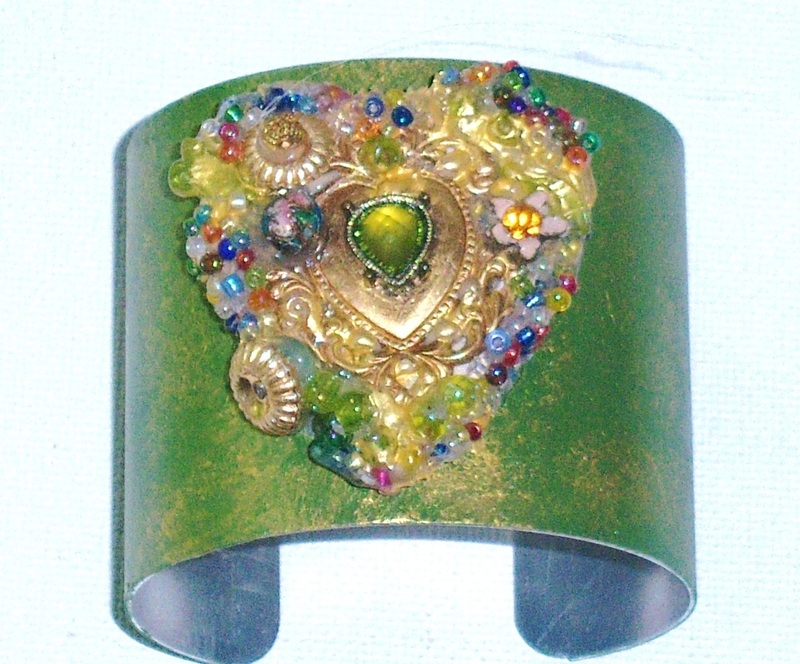 Flexible Cuff 1" wide, 6 1/2" long, Rhinestone Medallion 5/8"
Such a unique piece with its unusual painted finish, a glowing combo of green and gold, and the focal point, a hand-assembled decorative heart medallion! I pieced the medallion together, using antiqued findings, seed beads and rhinestones! Pretty funky! Hand-painted, original florals decorate each of the antiqued copper pendants that make up this uniquely-feminine bracelet...an artful piece that will add color and romantic charm to your wardrobe! 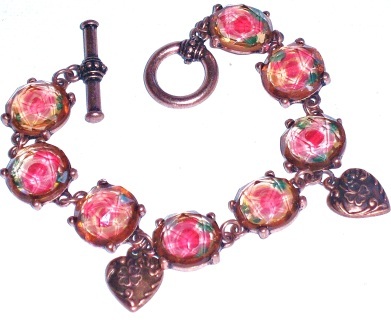 A unique Boho/Hippie-chic cuff with handmade charm, featuring a hand-formed heart medallion with a decorative floral bauble and a dangling "beaded" bead! I painted the wide metal cuff and heart a rich brown, and added golden flourishes to give the piece its Bohemian style! 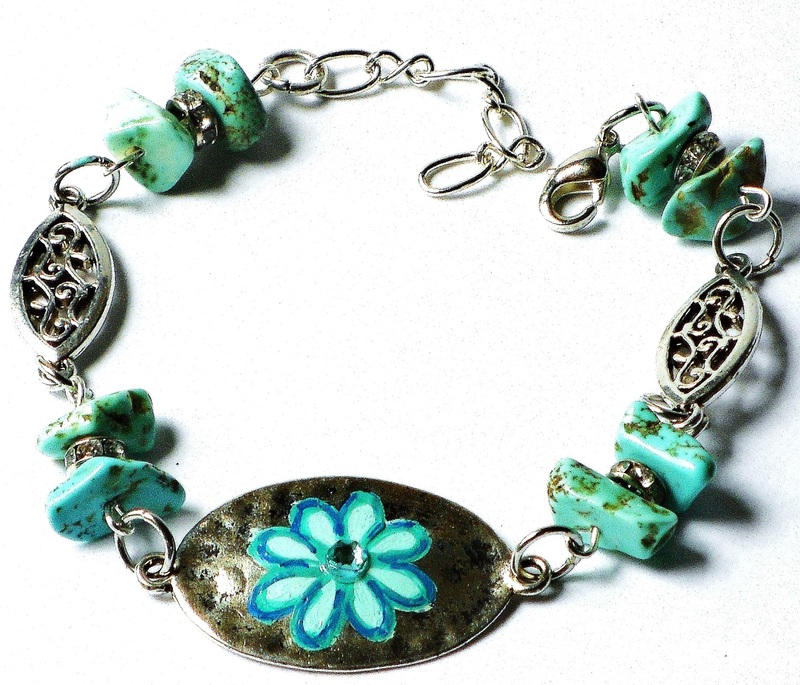 Flexible metal cuff 7" long, 2" wide, Polymer Clay Heart Medallion 2 1/4" high, floral decoration 1"
A flirty bracelet with artful style, featuring nuggets of genuine speckled aqua blue magnesite, with tiny rhinestone beads and a painted flower pendant in its center! A Swarovski crystal rhinestone sits in the middle of the turquoise flower sending sparkles of turquoise! Magnesite is thought to have powerful healing properties and is said to aid in achieving meditative states and this bracelet is a pretty way to take advantage of those powers! I added an extension chain so you will be assured of the perfect fit, too! It's the perfect accent for your beachy, summery outfits! DELICATE PINK FLORALS An artful bracelet with a vintage vibe...antiqued copper-framed faceted glass cabochons are linked together to create a unique bracelet. I reverse hand-painted pretty pink roses on the underside of each of the softly-tinted glass cabs, and the effect is muted and softly feminine. A couple of embossed antiqued copper heart charms added just the right touch! 7 1/2" long, toggle closure, heart charms 1/2"
A soft black leather cuff with chic floral style, covered in rhinestone studs and colorful hand-painted flowers with tiny sparkling Swarovski crystal rhinestones in their centers! 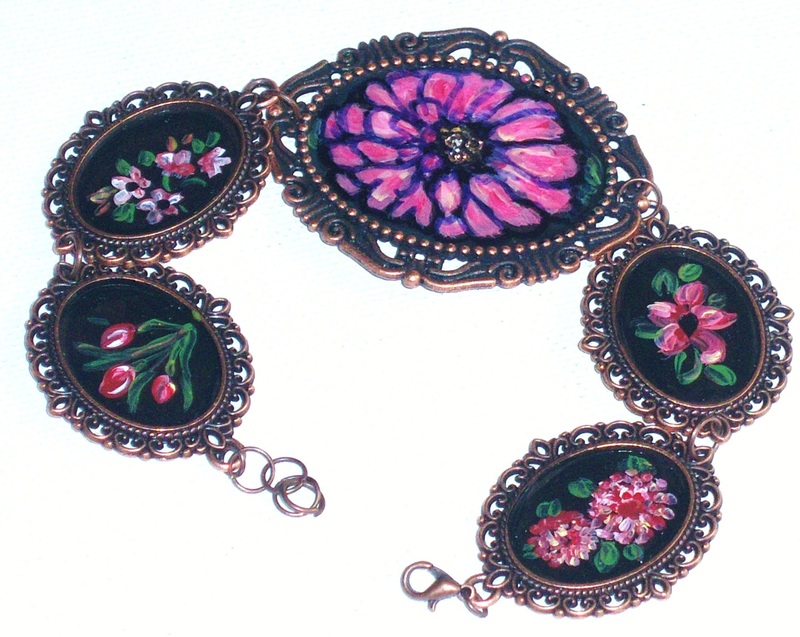 The painted flowers are accented with tiny leaves as they meander along the length of this unique bracelet and the studs add a touch of glam! And it will fit you comfortably because it's adjustable with two sets of snap closures! A beautiful cuff, covered in large pink roses and olive green leaves, with pink Swarovski crystal rhinestones sparkling from the center of a few select blooms! 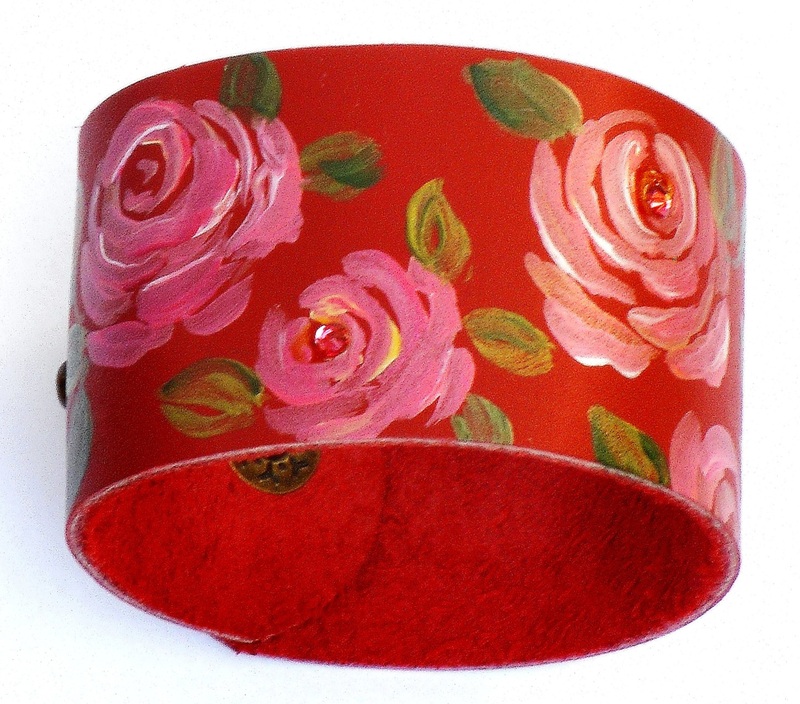 Using quality paints, the roses were carefully painted in shades of pink that has a soft shimmer to it! The genuine leather cuff is adjustable, too, with two snap closure size options, so you're sure to find the perfect fit! 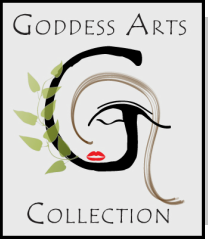 Add this one to your jewelry box for when a romantic, free-spirited fashion accessory is desired! 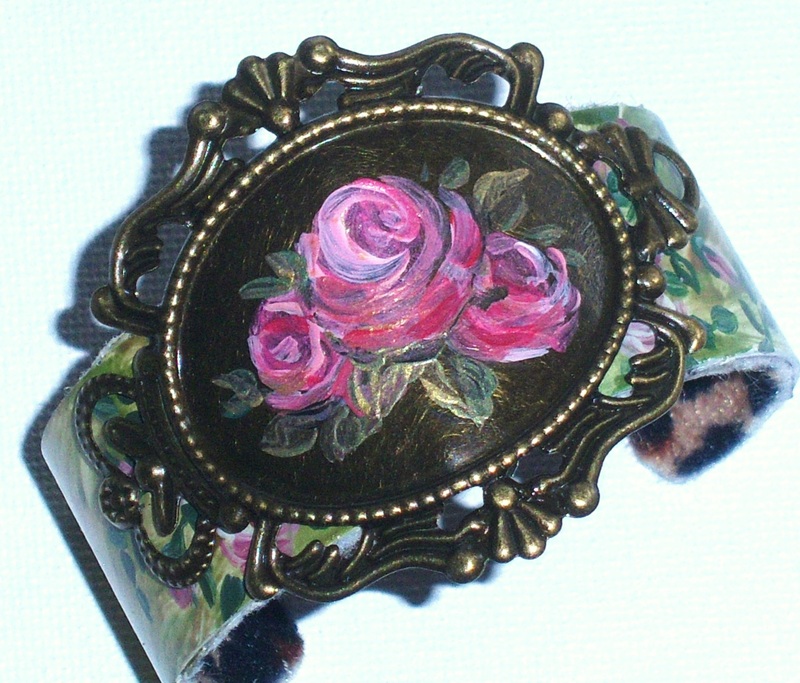 ARTFUL, UNIQUE A one-of-a-kind cuff with Bohemian appeal...I hand-painted it first in an antiqued golden brown, then I added tiny floral buds and vines and finished with a highly durable finish. 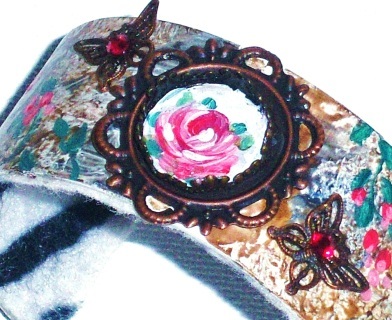 I added a pair of antiqued butterflies with ruby-colored Swarovski crystals to enhance the center medallion with its painted rose center....I then lined the cuff with a soft felt lining for comfort! 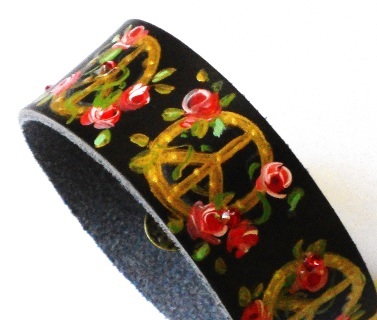 A very unique piece that will add a floral style to an outfit! 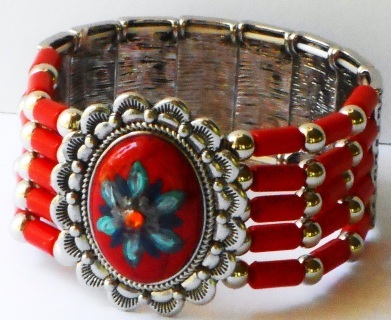 A unique bracelet of red and silver, featuring an oval silver-framed red cabochon that's decorated with a funky painted floral design with a Swarovski crystal adding its orange glow in its center! 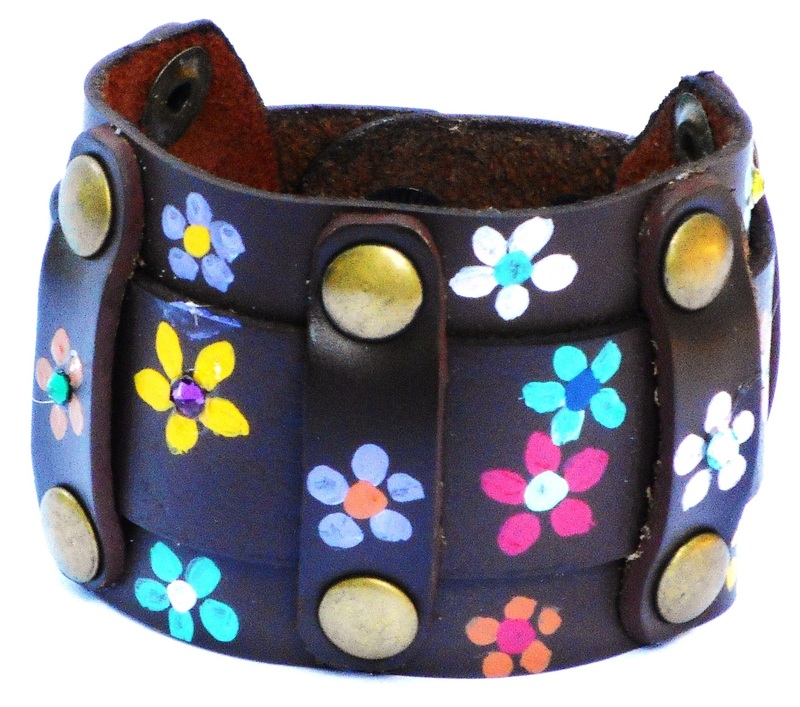 This fun, piece of limited edition wearable art will not only add colorful Hippie chic style to your outfit, it's also super-comfortable because it will adjust to any wrist size!